The Road Transport (Working Time) Regulations 2005 (SI 2005 No. 639 - "the Regulations"), came into force on 4 April 2005. The Regulations implement European Directive 2002/15/EC and apply to "mobile workers" (basically drivers, crew and other travelling staff) who operate on vehicles which are subject to Regulation (EC) No 561/2006 ("the European drivers' hours rules") or, in some cases, the AETR. Mobile workers are required to comply with the Regulations as well as the existing European drivers' hours’ rules. There is no opt-out from the Regulations. A mobile worker would qualify for exemption if: They work 10 days or less within scope of the EU drivers’ Hours rules in a reference period that is shorter than 26 weeks). 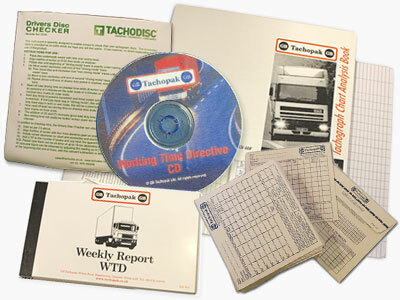 Weekly Report book WTD – for the full or part time driver to record his hours. Includes guidance notes on the WTD. Chart Analysis book - Use in the office to record and then calculate the average hours. Drivers Envelopes - Recently updated for WTD hours recording. Chart Checker - a simple device to quickly calculate Working, Driving, Breaks and POA from the tachograph chart. WTD CD – A full guide to the WTD including spread sheets allowing rolling inputs to calculate each drivers working time, over each reference period. Details of the WTD (mobile workers) can be found here. Please call our friendly Customer Service Help Line if you need further help or are unsure about the implications of the new Working Time Directive.